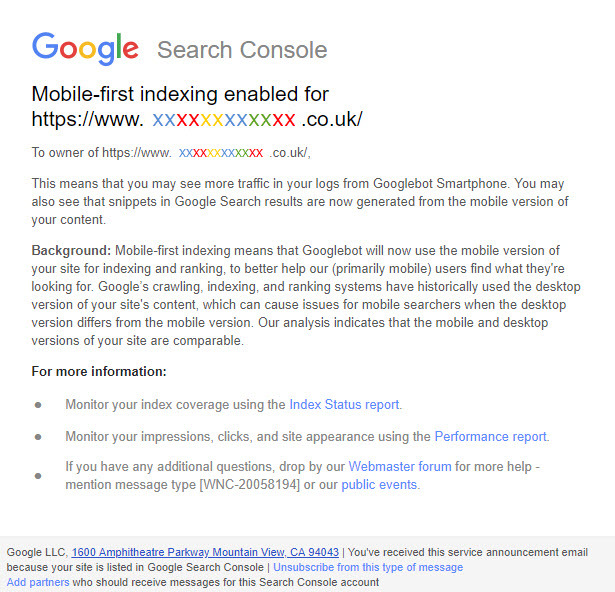 Google first announced their mobile first index initiation back in 2016 and issued a detailed plan of how they intended to make future algorithms index pages using the mobile version of a website and its content. The mobile first approach was the next logical step in Google’s consistent advancement, due to the vast number of internet users who now browse the web primarily using their mobile phone or a tablet at home and on-the-go. Studies in 2017 found that 63% of internet visits came from mobile devices, which is still up a significant 6% on 2016 when only 57% of visits were on mobile devices, so now that mobile is the considerable majority of internet usage and expected to continue rising, it is easy to understand the importance of the Google mobile-first index strategy. But what is mobile-first indexing exactly? How can you prepare for the change and what can you do to ensure you have a mobile-friendly website design? What is the mobile-first strategy and how will it affect me? Since the dawn of time (or the beginning of Google, at least) Google’s website crawlers, ranking techniques, and indexing systems have crawled a website specifically using the content from the desktop version. However, in 2016, Google decided to change this in an effort to echo the projection that mobile users would soon far out-weigh and out-perform the number of desktop users, a forecast that has proven to be accurate. The latest mobile-first development to be introduced will mean that Google will eventually use the mobile version of EVERY website to carry out indexing and to influence rankings and desktop will be left behind. This is to ensure that the majority audience – mobile device users – will be able to find exactly what it is they are looking for. With this in mind, if you do not have a mobile optimised website, the latest change in Google’s ranking algorithm will be very detrimental to your success in search engine results. If you don’t have a mobile responsive website, through ranking and indexing issued you inadvertently leave yourself at risk of missing out on traffic and conversions, which also results in a loss of sales and revenue. When is the initiation to prioritise mobile websites beginning? Google began trialing and scrutinising the mobile first approach back in 2016 and a number of websites have been experiencing the switch ever since. However, a much greater roll-out of mobile first indexing began in March 2018 and now vast numbers of business have been subject to the change, especially smaller, local businesses. You will be pleased to know, however, that it is not just a guessing game as to whether you have been hit struck by the mobile first bolt or not. As Google target your website migrates it to the mobile first indexing, website owners have been receiving emails to inform them of the change allowing users to act accordingly, whether this is to make any necessary alterations yourself, or to approach the digital marketing agency that manages your website and/or your digital campaigns. How do I find out is my website mobile friendly? Gone are the days where you need a completely separate website built for mobile usability. Google’s latest indexing algorithm will take into account desktop websites, but in order for them to rank under the new mobile-first strategy, they must be fully mobile-responsive. You can use Google’s mobile friendliness test to determine whether or not you have a mobile-friendly website, but bear in mind, this is the absolute minimum requirement. There is a difference between mobile-friendly and mobile responsive websites and you should put in every effort to make your website as responsive as possible to ensure that you don’t undo all of the hard work you put in to achieve your organic rankings. The two only appear to have minor differences, but these are differences that can be quite impactful on the performance of a website, especially the organic performance of a website under Google’s latest ranking algorithm. In short, all mobile responsive websites are mobile-friendly, but not all mobile-friendly websites are responsive – don’t take the risk! Should I convert website to mobile friendly? If so, how do I do this? The answer in one word: YES! For many years, businesses and website owners, in general, have been putting the mobile version of their website on the backburner, but this can’t be the way anymore. Even if we ignore Google’s mobile-first indexing change, the shift in today’s technology means the ever increasing rate of internet users who view websites on mobile devices only is a statistic that cannot be ignored. The easiest, quickest and most effective way to achieve a full-functioning and fully-responsive mobile website is to take it to the experts. A website design and development agency will know exactly what it takes to create the optimum mobile-friendly website that will help to keep your website reaping the organic rewards and keep your competitors off the top spot. Not only this, you won’t have to lift a finger throughout the process. The prospect of losing all organic traffic to your website should be enough reason for you to WANT to invest in and develop and fantastic mobile-responsive website that your website visitors – potential customers – can thoroughly enjoy and have a pleasant experience every time they visit. Having a mobile optimised website must become a huge focus for your business, your marketing efforts, and your website development if you wish to continuously drive organic visitors to your website. SEM Consultants has the appropriate in-house teams to develop your website to become fully-mobile responsive, or if you prefer a fresh start, we can build you a new mobile responsive website from scratch. Our website developer and SEO experts work cohesively to ensure we don’t miss a trick and to be certain that your new or existing website is fully mobile optimised and ready to keep the organic traffic flowing… even under Google’s latest mobile first approach! If you want us to help you get ready for the mobile first indexing initiation, contact us today using the form below and one of our team will be in touch. Or, if you prefer, you can call us now on 0121 552 6500.